The Perfect Tailgate Pasta Salad - Eat. Drink. Love. Last week, my good friend Raquel told me about a fundraiser that her daughter’s school was having so that they could afford to go on their first class trip. In order to raise the money, the Katzenbach School for the Deaf is selling pasta! But, this is no ordinary pasta! No, no, it’s FUN pasta! 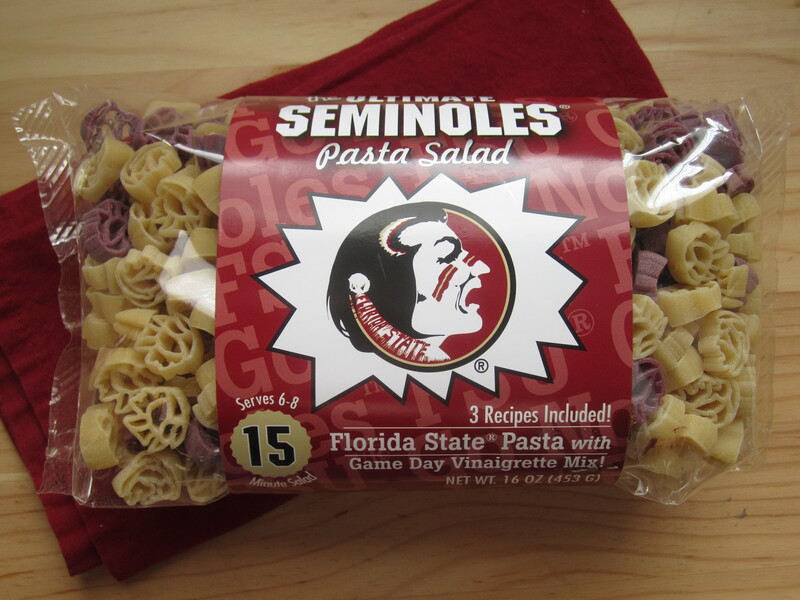 And when Raquel told me that they had Seminole pasta, I HAD to buy it! How fun is that?! I am totally loving these little Chief Osceola heads! The Early Childhood Program at The New Jersey School for the Deaf is raising money so that their little ones can finally go on a trip this year! The school earns 40% of all online sales. This is my daughter’s 2nd year enrolled in the program and because funds have been tight, she and her classmates haven’t been able to go on a field trip. For more information on the Early Childhood program, please visit this link! Thank you! If you are interested in buying some of this awesome pasta for a great cause, CLICK HERE! Then click the yellow button at the top that says “Shop Now”. The deadline for orders is November 14th. Now, onto this pasta salad. The pasta actually came with it’s own seasoning packet, but I wanted to share my favorite pasta salad recipe with you all so I am going to save the packet for another time. This pasta salad recipe is light and lower in fat compared to pasta salads that use mayo. I guess you can say this is an Italian style pasta salad! Just some EVOO and vinegars is all you really need! 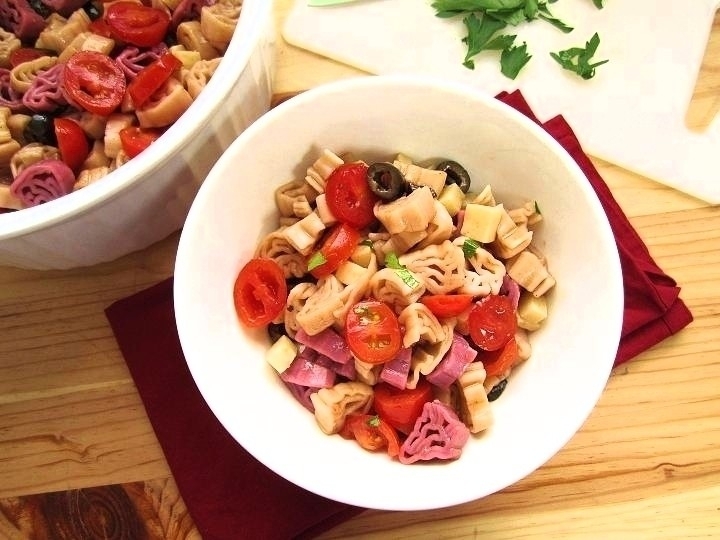 This pasta salad is perfect for tailgating because it is so easy to make and it does not require any refrigeration (though, if you plan to leave it out for an extended period of time, you may want to leave out the cheese and meat). I threw in some black olives, cherry tomatoes, and mozzarella cheese into mine, but you could use any of your favorite ingredients for this recipe! 1. In a large bowl, combine the cooked pasta, tomatoes, olives, cheese, and parsley. Set aside. 2. In a small bowl, whisk together the ingredients for the dressing. Pour over the pasta and mix well. Cover and refrigerate for about 2 hours (or overnight). Wow – that is a good pasta salad! My father is a ‘Nole – and my mother is a Gator. It’s very interesting on Saturdays at their house! They have “Noles and Gators too! Thanks, Ann! Too bad they don’t have a House Divided Pasta package like they do license plates and stickers, LOL! That pasta salad sounds perfect! Such a cute pasta. They can make anything these days. It just is so amazing to be a foodie these days. The possibilities are endless. Great pasta you made with this little cuties. Great program to support as well. Thanks, Kim! It is incredible, isn’t it?! So many fun products for us to use! What a cool pasta shape!! Your pasta salad looks light and delicious too! Since I have a strong dislike of mayo, I love pasta salads without! This one looks really good. The pasta is too cute! I have many friends in FL that would love this pasta. I’m sending them the link, it is such a great cause! They also have tons of other college teams as well. I have only had something like this at the deli and bravo to you for bringing us this wonderful recipe. Cold italian pasta would make a perfect light lunch! Thanks, Tina! They do have Gator pasta too! Gator pasta is available too! 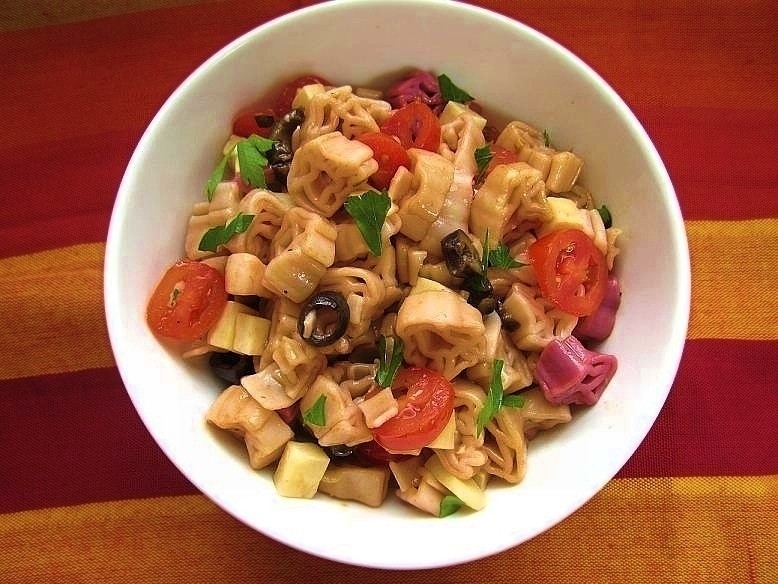 What a fun salad…especially with the Seminole pasta :) It sounds DELISH! Thanks, Liz! It is a very light and refreshing salad! Hey all! So glad you like the pasta! They have tons of college teams available as well as other sports, holidays, and novelties. You can find the link to my daughter’s school below. Thanks again for your support. The New Jersey/ Katzenbach School for the Deaf’s Early Childhood Program thanks you too! Can’t wait to try your awesome recipe Steph! What a great cause and those pastas are adorable. This salad sounds wonderful, especially for tailgating and pot-lucks! I think this is the cutest pasta salad I’ve ever seen… I absolutely adore those little Chief heads! Dee-lish. Thank you, Nicole! Aren’t they cute? I love a good pasta salad and this one looks delicious! The homemade dressing sounds divine. Thanks! The dressing is very light, but adds a nice flavor! Those pasta shapes are fun…and the vinaigrette recipe looks great. I would much prefer this to pasta salads with mayo. Thank you! I hate when salads like this are drowning in mayo! Oh ,what lovely colors. My stomach is grumbling. I wish I could have that on my table. 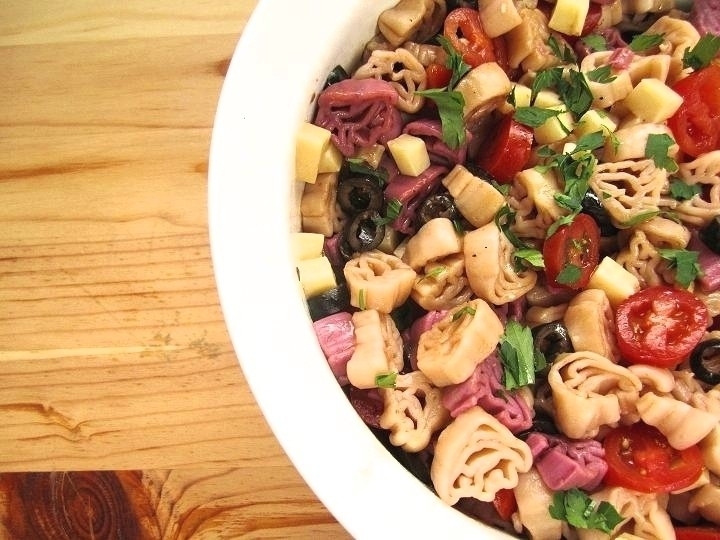 colorful and great recipe pasta salad. Anne, thank you so so much! I love that girlfriend pasta too! How great would it be for a girl’s night?! I had no idea you were a speech pathologist! I hope you like the recipe, it’s very light and refreshing. I am curious to try the vinaigrette that came with the pasta too, I bet it’s also tasty! What a great cause! I like various shape pasta – my kids appetite goes up quickly just because the pasta has shape! =) This pasta salad looks delicious! Thank you, Nami! Fun pasta is always more appealing for children! 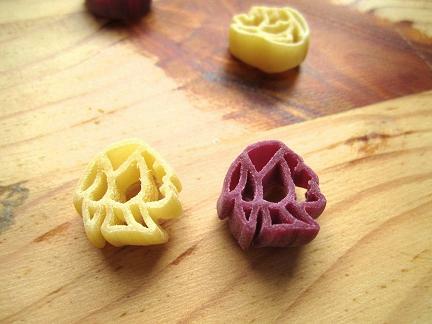 How cool is that pasta! I love pasta salads, and the one does look perfect! This pasta salad looks great! I love all the different colors in the salad. Little Chief heads?! How could anyone resist that kind of fun? ;0 – great looking pasta – I love the simplicity but complex flavours – yummm on the black olives! Super cute idea! And such a wonderful cause, too. Pingback: Buffalo Chicken Mac and Cheese « Eat. Drink. Love. The pasta shapes are so much fun! I love them! I usually get “weird” pasta shapes from World Market. Lucky me I saw this post before deadline. Going to buy some right now! Thank you for supporting this cause, Roxana! I’m such a huge fan of pasta salads using oil and vinegar instead of tons of mayo. Love the Italian twist with the salami, tomatoes and mozzarella. I bought the gobble gobble pasta – it’s going to be perfect for my Thanksgiving Mac n Cheese! I love that turkey pasta! Omg, that will be so cute on your table! Be sure to take pics! Its such as you learn my thoughts! You appear to know so much approximately this, such as you wrote the guide in it or something. I feel that you simply can do with a few percent to drive the message home a little bit, however other than that, that is wonderful blog. A fantastic read. I’ll certainly be back.